It’s important to remember that JACKIE BROWN, in 1997, was boy wonder Quentin Tarantino third feature – and his first following the smash-hit-phenom from 1993 that was PULP FICTION. Yes, in the years between those two, fans wondered what could the electrifying Tarantino possibly pull out of his unleashed id this time? In the meantime, whole books were written about the former video clerk and B-movie nut-turned-superstar director/producer/impresario and his earlier triumphs with PULP and RESERVOIR DOGS. Well, when JACKIE BROWN – an adaptation of the Elmore Leonard novel Rum Punch – finally premiered, a number of folks were let down. Possibly even more fans than were disappointed by STAR WARS (I DON’T EVEN CARE WHAT EPISODE IT WAS) THE PHANTOM MENACE. Because, well, dude, where’s my decapitations? Where’s the weird stuff? Where are the shot-by-shot tributes to some 1970s badly English-dubbed Yugoslavian grindhouse softcore horror movie nobody but QT ever saw during its limited run in some condemned LA fleapit? Listen, fanboys, you got your old Quentin Tarantino back with the KILL BILL series, not to mention INGLOURIOUS BASTERDS, DJANGO UNCHAINED and THE HATEFUL EIGHT. As for JACKIE BROWN, a curious one-off in Tarantino's ouvre of B- and Z-movie tributes with A-movie casts and budgets, look at it this way: it’s almost as though a late-career Quentin Tarentino movie fell through a wormhole in time and space from, oh, say 20 or 30 years from now. When the director has finally grown up, gotten his heart broken more often, and is an older, wiser, sadder and more sedate Tarantino that the one we know now, the kung-fu connoisseur who is the yin to Robert Rodriguez’…other yin. 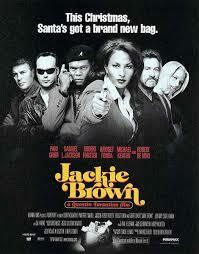 Ostensibly, JACKIE BROWN is Tarantino's noirish tribute to old-school (mostly 1970s) crime pictures. Action-heroine Pam Grier, who enjoyed name recognition in the era of SHAFT (the original) blowing up ghettos, is given a big, juicy valentine of a lead role by Quentin, playing the title character, Jackie Brown (a white blonde in Elmore’s source novel, by the way). She’s a flight attendant with a criminal conviction in her past, who has to earn a pitiful income with a seedy airline (oh, the movie’s set in Cleveland? I was sure it was LA) shuttling back and forth to Mexico. Jackie occasionally serves as a reluctant money courier for Ordell (Samuel L. Jackson), a dealer in arms and drugs. Caught by police after a tipoff, she fears the ruthless Ordell will murder her, just as he killed the informant (a short-lived Chris Tucker). In a series of double-crosses, Jackie tells Ordell she will retrieve his $500,000 fortune from Mexico right under the noses of cops. Meanwhile Jackie forms an alliance with her chivalrous bail bondsman Max Cherry (Robert Forster) to keep the cash. Again, don’t go in expecting a hyper-hip hyper-violent hyper-flick. Tarantino instead delivers a long, thoughtful, restrained, adult crime drama emphasizing emotion and relationships, not cool stunts or gore (all violence takes place offscreen or in longshot). It's a slow jam, not a chase picture, with diva Pam quite fine strutting her middle-aged allure in a nicely three-dimensional role, and matched beautifully by Forster’s bluesy turn as a subtle tough guy. Forster’s acting career, long mired in direct-to-video fare, also got a decent boost from the casting – as would David Carradine in the later KILL BILLs. Every old trouper should have a friend and patron like Tarantino.